All high altitude hiking is strenuous. If you are fit, the difficult hikes will be the most rewarding. If not, even an easier hike can be stressful. It's a good idea to spend some time and effort preparing for your hike. Guidance and tips on how to get in condition for hiking are presented in this document. NOTE: It is recommended that you consult with your doctor if you have a medical condition which may affect your ability to exercise; if you are starting to exercise for the first time; or if you plan to substantially increase the intensity of your current exercise program. 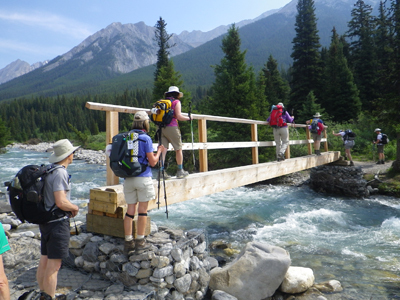 Each day in camp the Chief Leader organizes a hike program that includes at least one hike in each of the easy, moderate and strenuous categories. For safety and environmental reasons, our day hikes have no more than 10 hikers -- including the day leader and his/her alternate (or sweep). The minimum number of hikers is preferably not fewer than six, but an absolute minimum of four hikers per hike. All hike leaders are volunteers attending the respective camps. They receive no remuneration for leading hikes. The roster of hikes on offer during the week in camp will take in 12 or more destinations in number. Popular destinations will be programmed by the Chief Leader on several occasions throughout the week as demand dictates. Hikers will receive a copy of hike roster and map. At the orientation briefing, the Chief Leader for your camp will provide a general description of the hikes and how the daily hike program will be organized. Each evening around the campfire the Chief Leader will announce the hikes scheduled for following day along with the day leaders for each of the hikes. For the first several nights, a participant from each of that day's hikes will be asked to provide a brief unvarnished report back around the evening campfire. The categorization of a hike – i.e., easy, moderate or strenuous – is determined by the type of terrain trodden, total distance, cumulative elevation gain, and whether technical skill is involved. DO make sure your boots are broken in, sturdy, and have grip soles. We all have our own “built-in” natural gait. You’ll hike easier farther at your own pace. Don’t race. Don’t dawdle unless it’s that kind of hike. DO recognize your abilities and limitations when selecting your hikes. Go up steep grades by placing your foot flat on the ground and straightening your leg to complete the step. Descend steep grades by using a “spring” motion - toe first with knees bent take short steps. DO apply moleskin to tender spots as soon as you feel them and avoid the blisters. DO stay on the trail as marked. Do not take short cuts. DO spread out in a meadow or where there is no trail. DO stay with or behind your leader. Skyline hiking is a group activity. No group should be smaller than four (at the discretion of the group leader please). The Chief Leader is responsible for the entire group. Day leaders and assistant day leaders are responsible for day hikes and discipline if necessary. Stay with, and usually behind, the day leader. No intoxicants on the trail. Leave no sign of your passing, except footprints.